"Okay Snoopy - let's do this!" 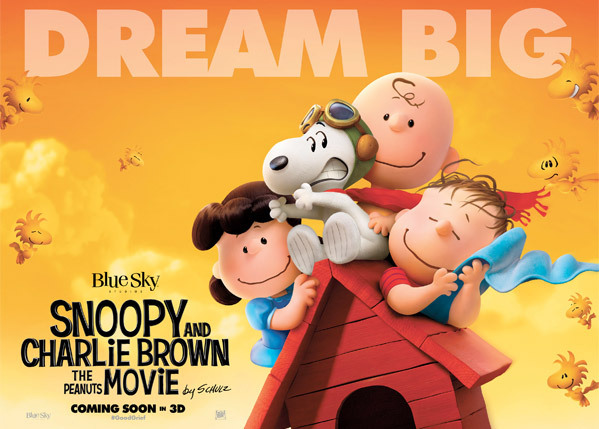 20th Century Fox and Blue Sky Animation have debuted the newest official trailer for The Peanuts Movie, one final push before this movie hits theaters in just over two months. The Peanuts Movie brings all your favorite Charles Schulz characters to the big screen: Charlie Brown, Sally, Peppermint Patty, Schroeder, Woodstock, Linus, Lucy, Pig-Pen and Patty. I love the animation style on this, it looks like a sleek mix of classic old school cartoons and new school computer animation, and it fits this story so well. Plus, this looks like so much fun. You won't stop smiling during this! Take one last look below. Peanuts is directed bey Steve Martino (Ice Age: Continental Drift, Horton Hears a Who!) and written by Craig & Bryan Schulz (sons of comic creator Charles Schulz) and newcomer Cornelius Uliano. Snoopy, the world’s most lovable beagle – and flying ace! – embarks upon his greatest mission as he and his team take to the skies to pursue their arch-nemesis, while his best pal Charlie Brown begins his own epic quest back home. 20th Century Fox has set the animated film for release in time for the 65th anniversary of the comic strip, and the 50th anniversary of the holiday special "A Charlie Brown Christmas," on November 6th. If you want to see the original teaser trailers again, click here. For more on the movie, visit the official site. Couldn't make it through the whole thing, but it didn't look as bad as I thought it would. Looks Great...voices are solid and animation looks terrific. My Family is in for this one!!! I saw a blimp advertising this above gurnee, il yesterday. Animation looks great, but the music is horrible. As usual...no love for Franklin. Sigh. What in the world were they thinking with all of that music for the preview? How many years of Peanut movies.. all with signature jazz piano. And now this putrid music. Just making a buck off the genius of Charles Schultz.